The U.S. stock market (S&P 500) has become overbought for the first time in a long time. It’s 14 daily RSI has reached 70 for the first time since late-January 2018 while it remains above its 200 daily moving average. In other words, momentum has returned to the stock market. When momentum returns to the stock market, its forward returns over the next year are very bullish. Don’t turn bearish just because the stock market is overbought. 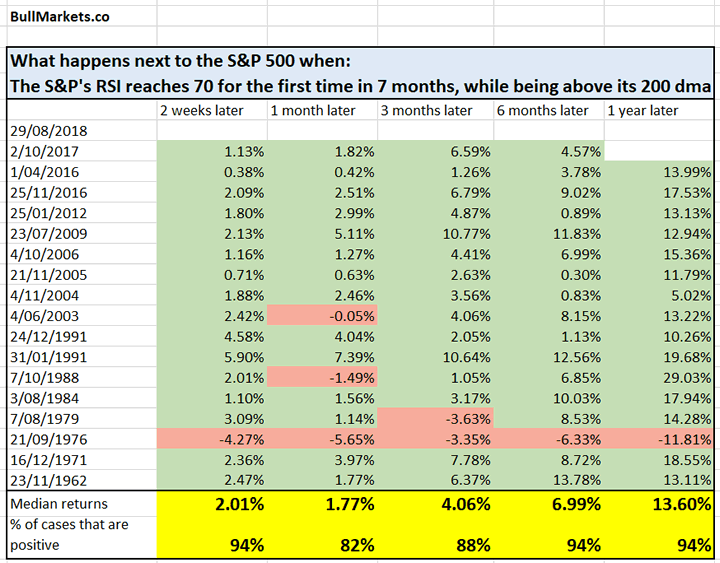 Here’s what happens next to the S&P when its RSI exceeds 70 for the first time in 7 months, while being above its 200 daily moving average (i.e. in an uptrend). Momentum has returned to the U.S. stock market. Contrary to popular belief, this IS NOT a bearish sign for the stock market. It is bullish on a short term, medium term, and long term basis.